On the rocks out of reach of any spring high-tides. Typical rock habitat next to Buck's-horn Plantain (Plantago coronopus) on the right. A prostrate sprawling mass of leaves and flowers. Leaves narrow linear and v-shaped in cross-section. Leaves in whorls of three or four around the often purplish stem. Leaves have many very short and silvery hairs or stipules on the edges. 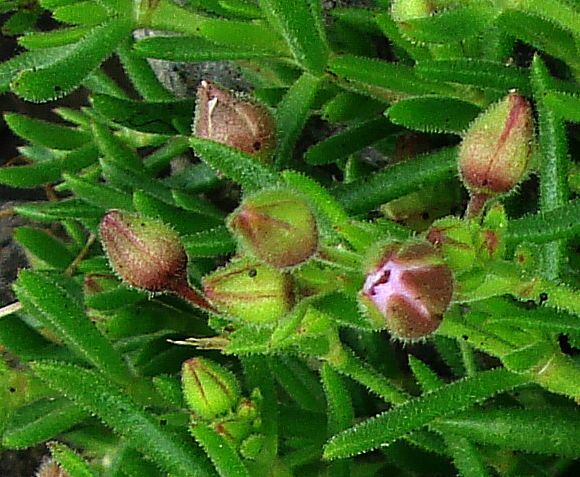 Flower buds have five purplish sepals, here un-opened. Leaves long and linear, possibly three-sided in cross-section, tapering to a point at the tip. The sepals also have silvery short stipules. 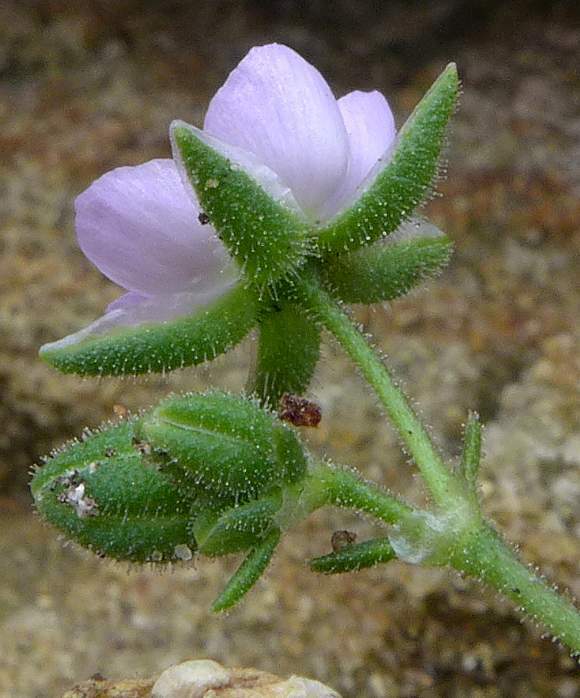 The leaves not as densely covered by sticky glandular hairs as are the sepals and flower stems. 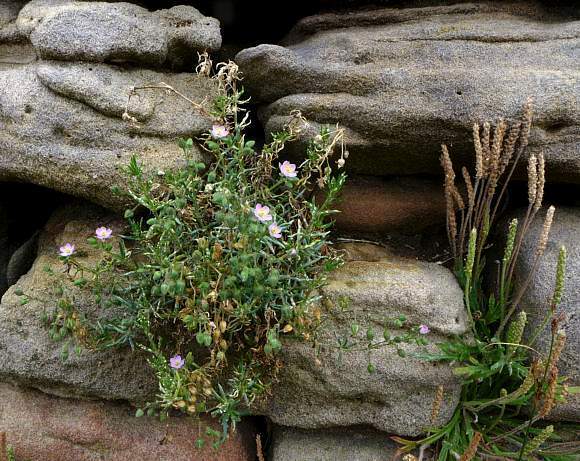 Flowers have five pink petals with the sepals as long as the petals. 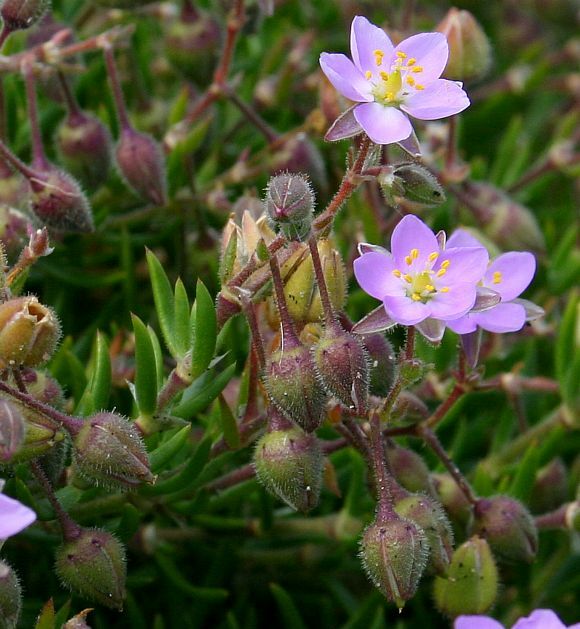 Unlike Greater Sea-Spurrey the centre of the flower does not have a white centre. Ten stamens bear yellow pollen. 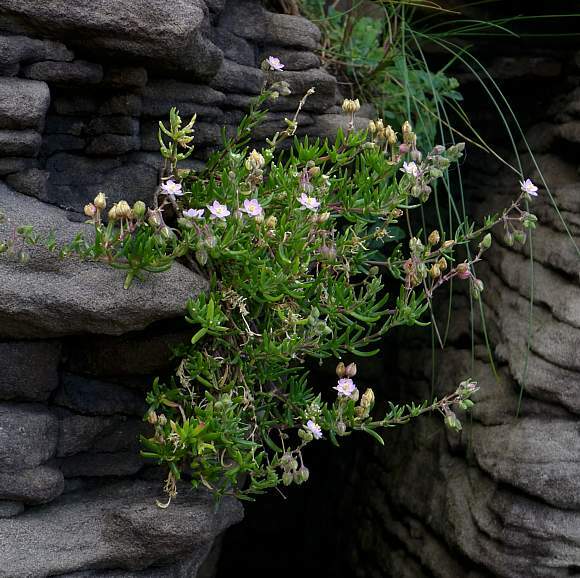 Like most sea-spurreys, the flowers are on short one-inch stalks that appear to be angled strangely as if broken. Purplish stems in evidence. Five sepals and petals, sepals longer than petals, and 10 stamens bearing yellow anthers. Central stigma with 3 styles. 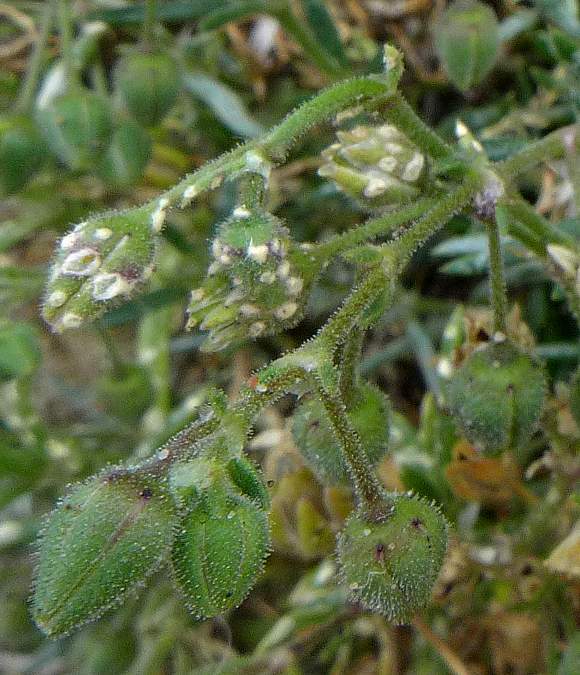 The sepals and stems are densely covered in sticky glandular hairs whereas the leaves are only sparsely hairy. Note also the short silvery stipules on the sepals. 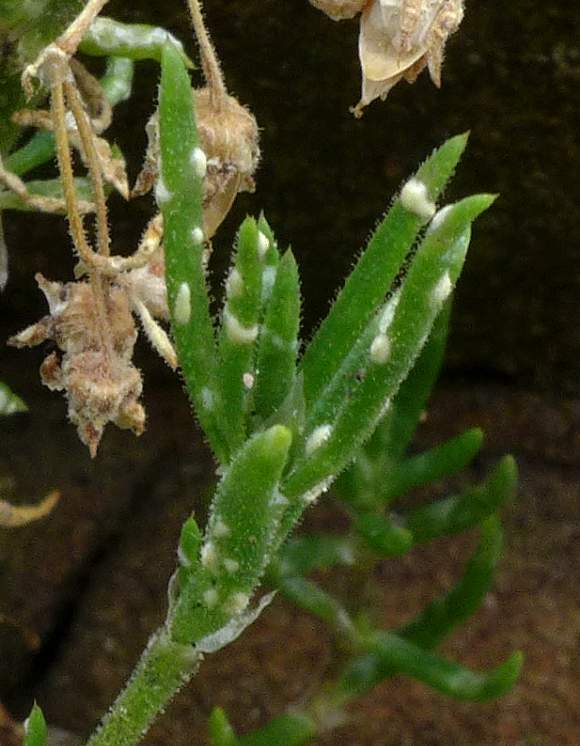 The rust which commonly infects Spergularia species is Albugo lepigoni which causes white pustules to erupt on exposed leaf surfaces. The rust Albugo lepigoni is also probably responsible for the fasciation of these flower buds, which have not yet opened but which seem to have tinier flowers poking out. 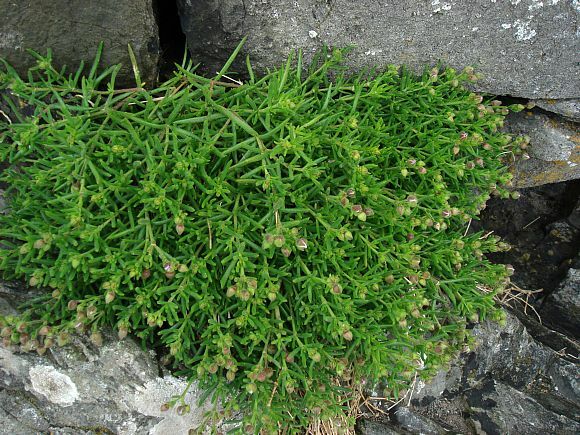 Not to be mistaken for: Lesser Sea-spurrey, Greater Sea-Spurrey or Matted Sea-Lavender . 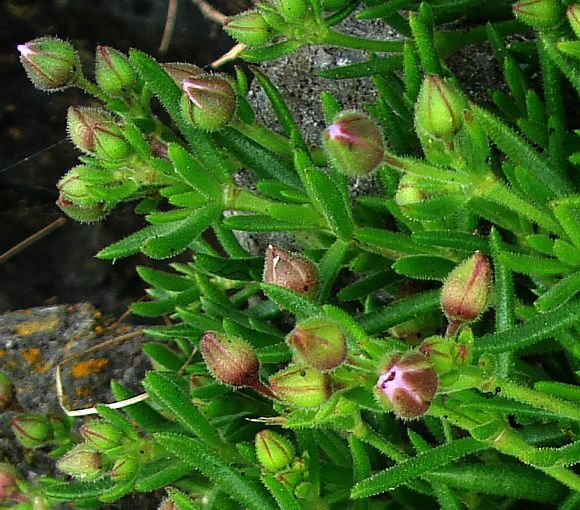 Easily confused with: Greater Sea-spurrey but unlike Rock Sea-spurrey it is larger, the stipules are not silvery, and the flowers tend to have whitish centres. 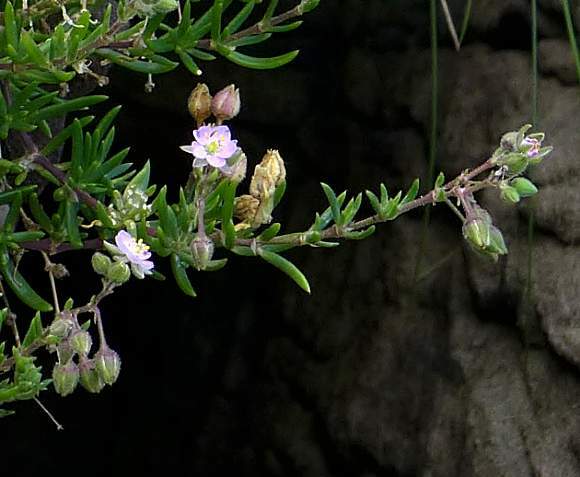 Also with Lesser Sea-spurrey but that has smaller and pinkier flowers where the petals are usually shorter than the sepals and also the sepals and stems are densely covered in sticky glandular hairs. 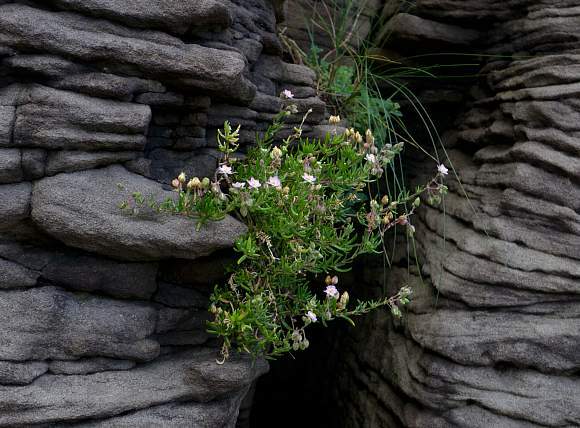 Found on cliffs, rocks and walls near the sea.